Anchorage, Alaska has received more than 100 inches of snow this winter. The height of the tunnel to people's homes is getting higher and higher. 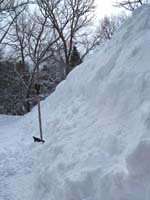 When they shovel an area, they have to throw the snow practically straight up from their path to get the snow well into the surrounding snowbanks. In this activity students experiment with graphing parabolas and manipulating those equations to try to establish a likely trajectory for a snow-throwing arc. Finally they decide how far someone will have to Throw Up. For members we have Word docs and solutions.